Canon has upgraded two L series telezoom lenses, with the announcement of the EF 70-200mm f4L IS II USM and the EF 70-200mm f2.8L IS III USM. 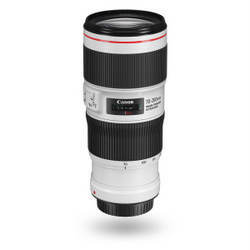 The Canon EF 70-200mm f4L IS USM. While no local pricing has been set, the American pricing provides a rough idea – US$1299 for the f4 and US$2099 for the f2.8 – just convert to A$, add GST and another 10-15 percent for the ‘Australia tax’! The major improvement with this lens is five shutter speed stops of image stabilisation correction, up from three on the original. The stabilisation system includes three IS modes for shooting various situations – still subjects, panning, and fast moving objects. The construction features 20 elements in 15 groups, with one fluorite and two UD lenses for improved image quality. It also has Canon’s fancy-sounding, super-duper Super Spectra Coating technology to help minimise ghosting and flaring, and fluorine coating on the front and rear elements to reduce smears and fingerprints. The lens has a circular nine-blade aperture, and an ‘Ring Ultrasonic Motor’ inner focusing system. Minimum focusing distance has been shortened from 1.2m to 1m. The lens weighs 780 grams. This lens is a totally mild upgrade from the predecessor – it’s primarily just new and improved coatings. The major new talking point is the addition of ‘Air Sphere Coating’, to reduce flaring and ghosting, and the front and rear fluorine coating mentioned earlier. The lens uses the same 23 lens elements in 19 groups, and 3.5 stop image stabilisation system as the superceded model. ‘The EF 70-200mm f/4L IS II USM epitomises the very finest in L-series optical technology, with impressive 5-stop Image Stabilization in a compact, robust and lightweight design; and the EF 70-200mm f/2.8L IS III USM offers unbeatable performance, versatility and durability to meet the demands of professional photographers,’ said Brendan Maher, Canon Australia product manager.